WATER CHARGES... HOW MUCH DO YOU PAY FOR YOUR MAINS WATER? Find out your daily monthly & annual water charge for domestic consumers & non domestic (commercial) consumers on our Water Charge Ready Reckoner. 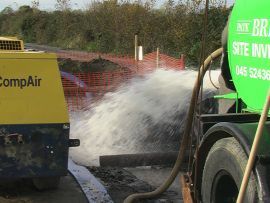 Unless a water well is properly "grouted" or sealed into bedrock, surface water with potential ecoli & faecal coli and other harmful bacteria will leak down the outside of the permanently installed steel or uPVC casing and enter the groundwater under the bottom of the casing in the rock or through perforations in the welded steel casing joints.. When a borehole is drilled a wider diameter socket is drilled into the rock to accommodate the smaller diameter permanently fitted steel casing or uPVC casing.....so there is little or no resistance to prevent contaminated surface water "destroying" your groundwater source. This is an important question to consider when it comes to drilling a properly sealed well to adhere to IGI Guideline (Water well guidelines,March 2007) and EPA Advice Note 14 "Borehole Construction and Wellhead Protection",Sept-2013. Too often, lately, Drilling Contractors will suggest that they can place grout/cement into an open hole (with no conductor casing) and push down the permanent steel casing or uPVC casing through the cement and ........"magic" the well will be sealed. There is no magic in drilling or well sealing. That blob of cement tipped into the openhole prior to installing the permanent steel or uPVC casing is not down and tightly packed around the outside of the permanent casing achieving an even annular column of cement/grout at this critical interface where the overburden changes to competent rock.The blob of cement is perched at the first point of collapse of the sides of the well,near surface, before installing the casing and pushing a liner through it clearly doesn't push on the the cement down the hole following the casing. From an Irish drilling experience....it's highly unlikely that you can confidently expect an unprotected openhole to remain stable while you install an inner uPVC or steel casing and proceed to effectively grout the annulus of the inner casing. (.......Leave aside the exceptions,for example; mud drilled boreholes & the occassional borehole with particularly stiff firm boulder clay overburden from surface to rock head). An openhole in overburden is typically unstable,liable to lateral movement as drill spoil is removed from the well during the overburden drilling process,susceptible to shallow water strike ingress,drilling strata often comprising loose sand & gravel layers/weathered rock encountered and by its nature,this drilling strata collapses as soon as you drill through these layers. The "open" borehole in the unlined overburden generally collapses as soon as the drill tools are removed from the borehole and prior to casings being installed. It's essential to use a outer temporary conductor casing to ensure that the cement slurry has a clean open annulus around the inner casing in order to grout from deep into the competent rock socket into which the inner casing is fitted right back up the borehole to surface to ensure an effective grout seal.The grout is generally injected at the annulus of the inner uPVC casing/steel casing by a tremie pipe method ( nominal 1" hollow pipe).This grouting operation is undertaken by use of a suitable Grouting Plant which displaces cement slurry to a specific gravity under pumping pressure through the tremie pipe and maintaining the pressure until displaced deep into fissures into the rock. As grout returns to surface,sections of the threaded tremie pipe are pulled back,unscrewed and removed from the tremie pipe string.In addition, the outer temporary conductor casing needs to be retrieved in sections ensuring that it remains just above the level in the borehole where the grout is being displaced. Pumping of grout should continue in one continuous operation until the grout slurry clearly returns to surface having displaced any standing water in the annulus of the hole as the grout returns to surface. Please refer to a related article on Domestic Borehole Grouting Review which puts the facts and figures around how a domestic well can be sealed effectively. Yes,it does cost more money to achieve an effective domestic well seal vis-a-vis an aesthetic attempt at sealing a standard 6" diameter well where cement is placed into an openhole prior to hammering in 6" steel casing. (Extra costs arise due to wider drilling diameters,grout band & bentonite pellet seal etc).The article attempts to dispell the myth that a 6" diameter domestic well in which no temporary conductor casing is fitted and cement is emplaced into the openhole prior to installing the 6" steel casing in the overburden.... that while it may aesthetically tick a box that the well is cement/sealed......in reality........save the €100-€200 that the Driller may charge for this element of works. 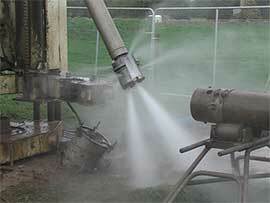 Borehole grouting needs to be done right or its ineffective. One of the major benefits of geothermal well water drilling is that it provides renewable energy, meaning that as long as we don’t pump too much cold water into the earth -cooling off the hot rocks- the energy will just keep on coming. 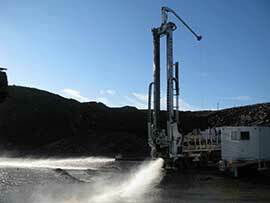 Vertical geothermal wells may be installed in almost any type of geological formation. Underground groundwater strike is not absolutely necessary. A second benefit of geothermal well water drilling is that its operation produces minimal pollution (1 kw electricity should produce 4 KW/heat) minimising its contribution to the greenhouse effect. The carbon footprint longterm is very limited. There is no impact on the groundwater resources. A third benefit of geothermal well drilling is the surface aesthetics for geothermal installations is very discrete....flush surface well covers and underground ducting into the plant room where the heat exchanger is located. There is very little impact on the surrounding environment. 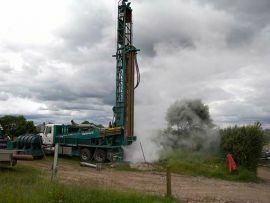 A fourth benefit of geothermal well drilling is the efficiency it offers frugal homeowner - once you’ve borne the costs of installing the geothermal energy heating system, the energy producing costs should be very reasonable. 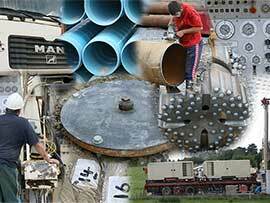 Equipment & materials used are very durable and generally involve minimal maintenance. The system may offer an optional extra to reverse the system during summer time to give cool air within buildings. Consider the benefits of grouting geothermal vertical closed looped wells.Whilst specialised thermally enhanced grouts will add to initial installation costs,the operational efficiency of the system and thereby running costs will be lower. 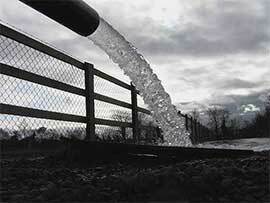 A minimum of 25% of water supply in Ireland is contributed from groundwater. 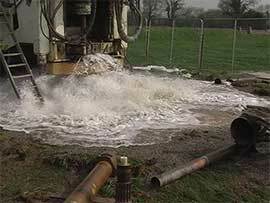 it is estimated that there are several hundred thounsands of private wells across rural Ireland. Geologically each well is quite unique...in a sense each has its own DNA inprint. A water well is much more than a vertical shaft into the ground. The depth and nature of the overburden throughout rural & urban Ireland is very variable. It could be free standing, easily drilled, dry, boulder clay,parts of rural County Meath or it could be saturated ‘running sands’ and the layers of broken weathered bedrock containing lots of water...for example parts Dublin central. Drilling through 40 feet of dry boulder clay at 10” diameter and installing casing could take about an hour, whereas drilling and driving casing into collapsing sands and boulders could take a day. In bedrock many varied drilling problems maybe encountered to achieve proper water well construction in rocks as diverse, weathered Devonian sandstones, fractured granites, deep highly altered dolomites in Tipperary, vast open karst caves in the Galway and Roscommon lowlands , and clogged, but ultimately high yield palaeo-karst cavities in Laois, Kildare Kilkenny, Carlow and Offaly. 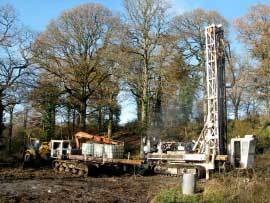 In addition, Belfast Sherwood sandstones fissured with dolerite underlying deep superficial deposits pose challenging conditions for the driller. 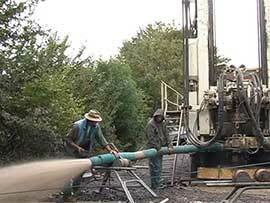 Water well drilling and borehole construction drilling often requires variation and adaptation. Unfortunately, the economics of drilling measured on a per/mtr basis to determine Drilling Contractor payment does not reflect a fair rate of pay in very difficult and varied geological formation. On a recent exploration drilling programme in a rural location,our Reich rig encountered running sands and gravels containing a lot of water in a large cavity in limestones at 42 – 53 metres. The contract specification was for a 90 metre deep borehole, therefore we were obliged to make progress beyond the cavity. It took a whole ten hour day to make progress through the cavity, and 50 tonnes of sand were removed from the hole. 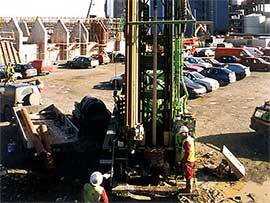 Neither the client nor the driller expected the sand and water filled cavity. The work done to clear the cavity and get good water, was advantageous to the client, but placed a considerable strain on the drilling equipment. We were paid €450 for the days work, even though we had worked all day to meet the clients needs. The financial & equipment risk exposure to the Drilling Contractor paid on a per/mtr basis for a water well as a result of variations in geological formations is very high. 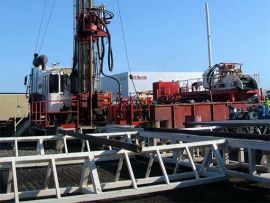 He is obliged to deal with whatever geological formation encountered irrespective of the time,wear and tear of his equipment and unforeseen operating costs including diesel,excess bit wear in order to complete the well specification.Its not surprising that a Drilling Contractor will regularly finish up working below costs. The Home Renovation Incentive (HRI) is being introduced as a means of incentivising the construction sector.The works must be carried out on a person's main or principal private residence and qualifying works include a range of services including plastering,plumbing, bathroom upgrades, landscaping,fitting of kitchens and supply & fitting windows etc. The incentive is designed to support tax compliant Contractors who must be registered for VAT. Patrick Briody & Sons Ltd has sought clarification from Revenue with respect to installing a private well & related services (pump installation,water treatment & associated civil works) for existing dwellings whether these works are eligible under the HRI scheme. 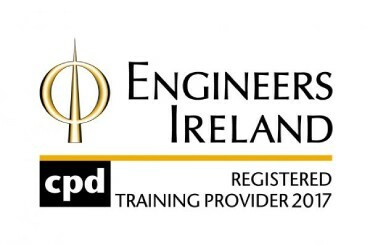 Revenue have confirmed that the scheme also includes drilling of a private well where current water supply is inadequate or of a poor quality,building of a pump house,if necessary,submersible pump installation & water treatement where appropriate.The work can be carried out as one Job or on a phased basis and it can be carried out by one or more Contractors for the different elements of the works. So now is the time to take on that new water supply project....meters are being installed placing an annual cost of water on mains water,assurance on good quality water supply & consistent pressure is essential and now your are being incentivised to kick-on with the works.Go for it!! 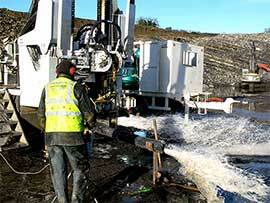 We are acknowledged as providers of the highest quality well water drilling service operating across Industrial, Commercial, Local Authority and private well spheres throughout Ireland. Be assured we Lead By Example but continue to quote very competitive prices at all times on all our water well drilling services. CALL US NOW.